January 5, 2018, 11:27 AM · Back in the day, one had to beg, borrow or buy some expensive camera equipment in order to record oneself playing. How times have changed! The smart phone and its handy camera have made it a lot easier for most people to be able to easily record themselves playing. It might not produce a top-level video, but certainly it's enough to be able to do some self-analysis. 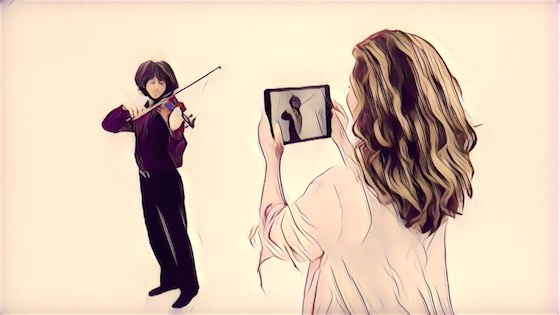 Earlier this week, Virginia-based violin professor Susanna Klein shared some great ideas in her Violinist.com blog about how teachers and students can use video to track improvements, analyze the way they practice and notice things about their playing that they might not catch while concentrating on playing. How often do you use video in your violin practice or teaching? What kinds of things does it help you with? How long have you been recording yourself? Or is it something that you just don't do or have not tried? Please participate in the vote and then share your thoughts and tips in the comments section. January 5, 2018 at 10:08 PM · If you were painting you would step back from the canvas. We can do that too, by recording ourselves. If you record just a little bit and play it back with the volume so low it's barely audible then it won't hurt as much. You just need to find something to improve. Then record it again to see if you got it! When I practice there's always something! It's a lot of fun to practice this way, or, in any case, I enjoy it! I started doing that regularly in 1996, with cassette tapes, and now these video cameras are relatively cheap, and you can just hook it up to a TV set. I was in the Barcelona orchestra, went through St. Louis and Rochester and ended up here in Utah. You can be your own teacher, and of course you can consult your friends by uploading unlisted YouTube videos and sending them the links. January 5, 2018 at 10:44 PM · I record myself playing from time to time because I can piak up mistakes I wouldn't notice as a performer. January 6, 2018 at 01:40 AM · Not as often as I should. It's always a revelation. January 6, 2018 at 07:30 AM · I used my cellphone for a few years and didn't record myself that often, but since I have got my Zoom H2N, I have been recording my playing a few times a week. The quality of recording matters and Zoom really helped me to identity little stuff that my cellphone didn't. January 6, 2018 at 07:32 AM · I used my cellphone for a few years and didn't record myself that often, but since I have got my Zoom H2N, I have been recording my playing a few times a week. The quality of recording matters and Zoom really helped me to identity colour variations and some little details that my cellphone didn't. January 6, 2018 at 12:06 PM · I wasn't doing this some years before..but since The camera quality sound has been improved and Playback was easy to find ,I have never let a single day without recording me!!!?? January 6, 2018 at 06:51 PM · I'm in a couple of Facebook practice groups that encourage the sharing of videos within the group. They are closed groups of learners with rules about the kinds of critiques that are allowed, which means the videos have a limited audience and aren't going to be trolled. That has gotten me much more comfortable with recording myself, watching the videos, and sharing them. I still find the process of recording and posting videos a little tedious, though. I feel like it takes me longer to get through something I want to practice when I have to also record it and post it to Facebook. That's probably why I still haven't upgraded my recording equipment. The iphone's quality has improved over the ipod touch I used to use and it makes the process pretty straightforward and easy. January 7, 2018 at 06:33 AM · I know not enough! Need to try to do it much more often. January 7, 2018 at 12:26 PM · After I have recorded a practice session I will wait to review the video. I find that if I review the recording right away I am super critical of my playing. Amazing what you will see and hear if allow just a day or two before you critique yourself. Don't worry you still hear areas of improvement but you may just be able to hear areas where you have improved. And if you use an app which records in slow motion you have now added a new dimension for analyzing your playing.